Looking for an activity that is fun and free, lets you interact with animals, and benefits conservation? You can release turtles with the Bali Sea Turtle Society (BSTS) as a volunteer! This is a conservation project that was founded by a Balinese local, Wayan Wiradnyana, in 2001. The busy coast of Bali (especially Kuta) is a popular spot for sea turtles to lay their eggs, so BSTS rescues the eggs and protects them until the turtles are hatched and ready to be released into the wild. There are several organizations working with turtle conservation in Bali, but BSTS is the best known and seems to have the best management. Today, it draws crowds of people wanting to release baby sea turtles. This is a free volunteer activity open to anyone. Donations are welcome, but it’s completely free — you don’t have to pay anything to release a turtle. The only thing you have to do is get in line early enough to get a ticket, because there is a limited number of turtles and lots of people want to release them. There was a huge group of Chinese tourists when we went in July, so we almost didn’t get a spot in line. After you turn in your ticket at the front, they will give you your baby sea turtle in a lidless plastic container with some water in it. My turtle was VERY determined to climb out of the container, and almost fell out, so just keep an eye on this and make sure your turtle doesn’t escape the container. When everyone has their turtles, BSTS will gather everyone together at Kuta Beach (it’s only 50 yards away) and then you’ll stop behind a blue rope on the sand. When they give the signal, everyone can release their turtles and watch them run to the ocean. Freedom! 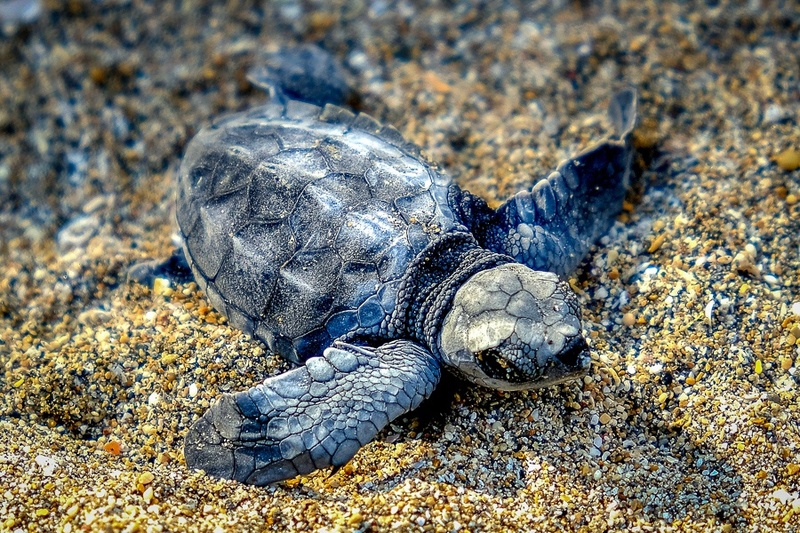 The sea turtle nesting and hatching season in Bali is from approximately April to October each year. It’s possible to release turtles with BSTS outside of these months, but not as likely. During these busy months, there are turtle releases almost every day of the week. Follow the Bali Sea Turtle Society Facebook page and monitor the announcements for each turtle release (generally it’s announced 6 to 24 hours in advance). With that said, if you’re staying near Kuta and really want to have the best shot at doing this then I’d recommend going to BSTS even if there isn’t a release announced on Facebook. I’ve heard of some days where they release 250 turtles without any announcement on Facebook (! ), because they don’t always have time to keep their page up to date. The turtle release happens at 4:30 PM, and tickets generally start being handed out at 4 PM, although this can vary (the Facebook announcements will tell). I would recommend being there at least an hour early, so you can be sure to get a good place in line. There was a huge crowd when we went in July, and we almost didn’t get a spot in line. BSTS is located at Kuta Beach, Bali. Just look for the big turtle statue by the sidewalk. The turtle release happens right there on the beach. It’s possible to do this as a day trip from any part of the island, but if you’re staying outside of Kuta just be sure to leave early to account for the very real possibility of traffic jams in some parts of the island. There was a ton of traffic in Kuta when we did this in July. One of the bonuses of doing the turtle release is that you get to catch the sunset at Kuta Beach too!